Fukiya Furusato Village (吹屋ふるさと村) is located middle north-west of Okayama Prefecture. 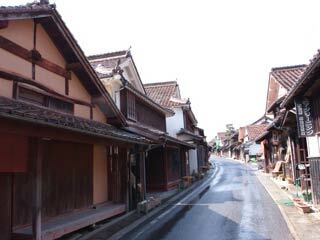 Fukiya is Edo Style town with many traditional houses which remain since Edo period. It is also known as the town of "Bengara." Bengara is colcothar ink made from oxidized iron which commonly produced in this area during Edo period. It was chosen as top 8 of the best walking spots. The main street is designated as the national historical and cultural important preserved district. There is a map you can get at the visitor's center. There is a parking. ... is one of remaining Edo style houses in Fukiya. It is designated as the national important property. This house is over 200 years old. Katayama family was one of the Bengara Produce. They produced Bengara for over 200 years, and they built this house with the money they made. Today, it opens for public. ... is one of remaining Edo style houses in Fukiya. It was built in 1874 by Shrine Carpenter, Shimada Tsunekichi. Therefore is no nail used in this house. It was 2nd house of Katayama Family. Because Katayama was one of the richest Bengara Producer, he used the finest materials and art at that time. It's open public today. ... was built in the end of Edo period. Hirokane Motoharu, the 2nd owner of Bengara factory, spend a tremendous amount of his family fortune to built giant house and his private Stone walls. ... is restored plantation of Bengara Factory. This factory was used until 1974 by Tamura family. Bengara production was started in 1707. This Bengara Museum shows the process of making Bengara from oxidized iron. ... was found in 807. Many Sengoku Daimyo, the feudal lords fought for the right and interest of this mining. In Edoperiod, it was directly owned by Tokugawa Government.